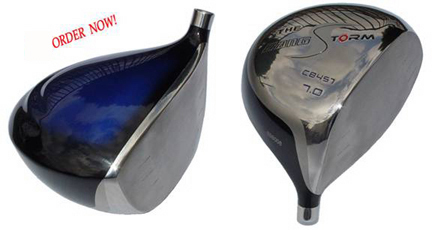 We designed The Bang Storm with an extra large face and a higher center of gravity than most drivers on the market. This new design gives you a larger sweet spot on the club face, while reducing the spin and launch angle. The Storms deep blue finish that fades to black is simply beautiful to look at and gives you the confidence to grip it and rip it! Available from Clubmaker Online as a component or assembled driver. Email us for help choosing the perfect shaft for your game.